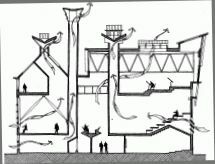 Passive cooling techniques (solar chimneys, thermal mass, ventilation, roof ponds, ...). A very good article that provides a simple method to allow you to determine which passive cooling techniques are best for your climate. This article is based on the book "Sun, Wind and Light" (see below). Claire Anderson -- Home Power issue 154. Very good article on simple techniques to prevent heat gain and to provide passive cooling. It includes a method to determine which cooling techniques will work best for your climate. 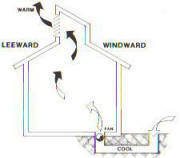 See also "Cooling Your Home Efficiently", Claire Anderson -- Home Power issue 154. 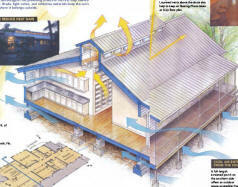 How to get articles from Fine Homebuilding ... A home that illustrates how a number of simple cooling techniques that were combined in this house to avoid the need for air conditioning in this south Florida climate. Article on passive design cooling techniques for hot humid climates with examples. Many techniques covered. 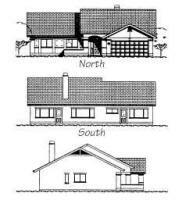 Comparison of energy of a home designed with many energy efficiency features to a same size conventional construction home. This is a very detailed and carefully done study of two houses of the same size in Lakeland Florida. One house was built conventionally, and the other was equipped with a wide array of features to reduce energy consumption, including: reflective roof, internal duct system, thermal mass inside insulation, high efficiency and properly sized AC, well designed overhangs, and optimal windows. The measured energy consumption was 70% less on the house with low energy use features. A solar PV system offset and additional 22%, bringing the net energy use to near zero. The reports provide quite a bit of detail on the saving achieved by each energy efficient design feature. This is a fascinating house in Leyte Philippines that is passively cooled using a number of unique methods including a double roof, a strategy for shading south and north walls in low latitudes using the roof, and double walls on the east and west for shading. The house also uses day to night temperature differences and basement cooled air as part of the cooling strategy. This house is definitely worth taking a look at if you live in a low latitude hot climate. 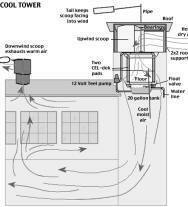 A good overview of passive cooling strategies. Good guide to passive cooling houses in the SE humid and warm climates. 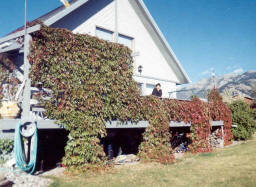 Landscaping for Energy Efficiency (pdf) Booklet on landscaping for energy efficiency. "Carefully positioned trees can save up to 25% of household's energy consumption". Several other energy saving "briefs" also available here. Properly sized overhangs on south windows keep you cool in the summer and collect sun in the winter. Be sure to pick a location near you, or enter your latitude/longitude -- otherwise, sun motions and shadows will not be correct. SketchUp is a free 3D drawing tool from Google. In addition to be exceptionally easy to use as a general purpose drawing tool, it offers a shadows made by a built in sun. You can easily draw a wall with a window and overhang, and play the sun over it for various times of day and times of year. It could also be used to layout your whole house (with trees and sunspaces), and see how the sun plays over it. Details on a large number of specific design strategies for making effective use of the sun and wind, and natural lighting. It includes quantitative analysis techniques for each strategy. Intended for architects, but quite readable. Covers commercial buildings as well as residences. A short but good Fact Sheet on radiant barriers from SouthFace.org. Note: the psychrometric charts that this tool produces have an overlay indicating which type of cooling techniques will work well in your climate. A really nice tool. Climate Consultant is one of the UCLA Energy Design Tools. 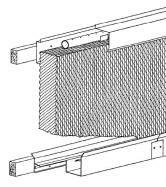 An FSEC evaluation of the energy saving for radiant barriers. Nine houses were monitored for attic temperatures and AC energy use before and after installing a radiant barrier. Bottom line was an about 10% reduction in AC energy costs, and a somewhat improved comfort level. Gary As much as half the heat gain to your house can come from unshaded windows. The sunny day heat gain from a hundred square feet of east or west facing window is the equivalent of running your furnace for several hours. This is my 2 cents worth on several effective and (mostly) inexpensive ways to shade your windows and cut down on house overheating, high AC bills, and greenhouse gas emissions. A similar screening from Real goods This seems like a pretty good idea for reducing summer heat gain on windows. 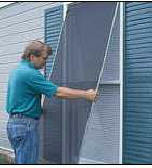 The shades block up to 90% of sunlight, and mount in vinyl frames (like bug screens). It looks like they would work on a wide variety of windows, including ones that would be difficult to handle with other shading techniques. They do the shading on the outside, where its most effect. It seems like a DIY version could be worked out. The Phifer SunTex material is said to be available at some home centers. Frames could probably be made from the same material that home centers sell for making insect screens. Details... 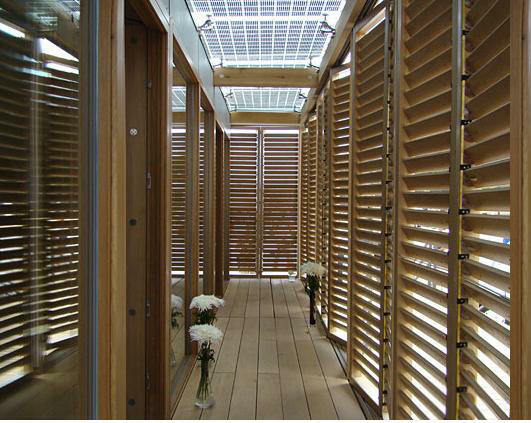 These are exterior shades that roll down to to provide filtered shade, but still allow a view out. We have these, and like them. All the details ... My neighbor has a terrific trellis with vines shading structure. It makes for a great shady place to sit on hot sunny summer days. In the winter with the leaves gone, it provides filtered sun and some solar gain to the window area behind. And, it provides beautiful fall color. Plans for a simple rollup shade from shade cloth. 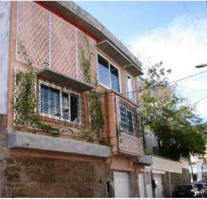 ECO house in Rio de Janero uses an aluminum trellis to support plants that will shade the house wall from from sun. 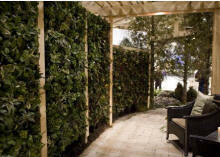 In addition to all the "green" benefits that these living walls provide, it seems like they could be very useful for reducing heat gain from walls that get a lot of sun. Lots of example photos and some "hot to" information at this website. 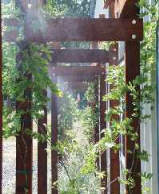 Some sample projects/pictures that use an external trellis for shading. This approach works well on East and West facing windows where overhangs are not effective. 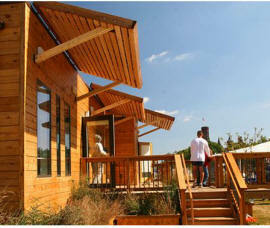 German entry in the 2007 Solar Decathlon had a nice porch/shading structure. Note the roof of porch is PV modules. Note that this would even work on east and west exposures. And, this nice overhang on the Urbana-Champaign entry. 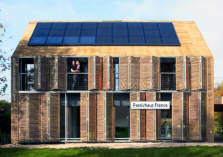 A home in France built to Passive House Standards uses a very unique shading structure that shades the full south wall of the house with movable bamboo shutters. Thanks to the folks at HomeEnergySolutions for the good ideas!! 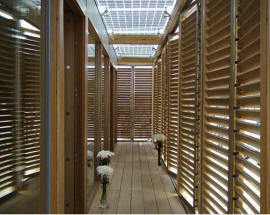 A pretty neat design for a operable shutter with plants for sun control. This design seems as though it might work well for blocking unwanted solar gain on windows (particularly on difficult to shade east and west facing windows). For this purpose, it would best be installed outside the window on the ground or on a balcony. Judging from the comments, it might be good to think about some type of watering system. 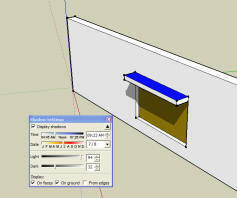 Plans for a simple wood framed, shade cloth awning to provide window shade and reduce heat gain. 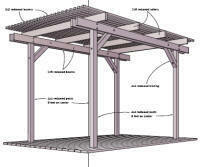 Plans for a simple wood framed, shade cloth pergola from Alnet. 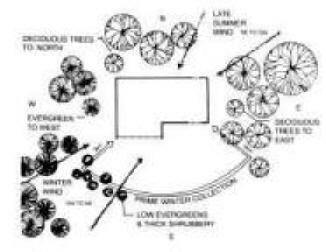 Plans for a very elegant shade structure. 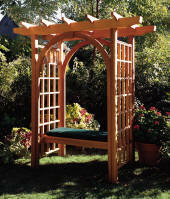 This could be used as a standalone shade structure or adapted to shade a house window. Detailed plans for a free standing shading structure. Could be used for yard/deck shade, or to shade a window. Plans for a simple rollup shade from Charlie's Greenhouse in Seattle. 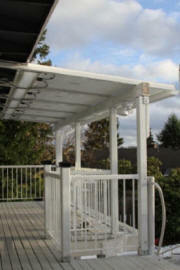 Solar Deck Canopy -- How Well Does It Let Light Through During Winter? 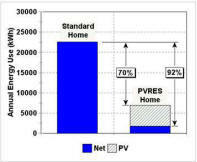 Amy Heidner, PE, 2012 This is a very interesting paper demonstrating the use of PV panels as part of a shade canopy that provides shade for living space that was overheating and generates solar electricity as well. The aim of the project was to provide sufficient shading to keep the living area behind the canopy from overheating, while at the same time not providing so much shade that the the deck and living area would be too dark. The authors found that by selecting a PV module design that lets some light through and adding some glazed areas above and below the PV modules that they could get just the right light levels under the canopy. 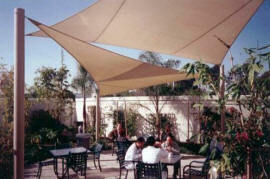 Shade Sails (or Solar Sails) are fabric membranes supported by fixed anchors, and positioned to provide shade. They are laid out and tensioned in such a way as to be very resistant to winds. They can be very nice looking indeed, and can handle some difficult shading problems. 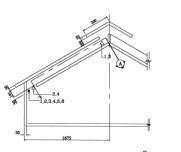 This is an excellent paper that compares the attic temperatures for 6 different roof constructions. Following the findings of this study can have a major impact on your cooling costs. Reflective metal roofing can keep your house cooler and save on cooling bills. Parker, Huang, Konopacki, Gartland, Sherwin, and Gu. A sampling of commercial sources ... Actual measurements of reduction in cooling energy for 8 homes in Florida before and after coating the roof with a reflective (white) coating. Cooling energy savings averaged 20% just by going to a more reflective roof. 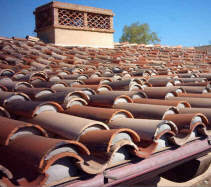 The papers cover both roofing materials that are reflective as well as coatings that can be applied on existing roofs. The paper on Roofing Material Reflectivity is good and surprising. The flip side of this is that if you live in a cold climate, painting your home with a dark shade will result in a saving in heating energy. "CoolWall" paint reduces cooling costs by formulating the paint to be reflective in the IR, but any color you like in the visible spectrum. In other words, you can get the same sort of cooling benefit that comes from painting your house white without having to have a white house. While many of the "save energy with paint" schemes are scams, this one has been tested extensively by he ORNL (see links), and does result in a 4 to 21% reduction in cooling energy. It should not be used in cold climates in that the same high reflectance in the IR that reduces cooling energy use increases heating energy use. For example, in Richmond VA, the reduction in summer cooling energy is more than offset by the increase in winter heating energy. In the ORNL testing, white paint outperforms the IR reflective cool wall colors -- so, white paint is good for hot climates. David's White Roof Experiment ... David painted his roof white to measure the amount of cooling that the reflective roof brought to his attic and living area. "...all houses in traditional villages on Greek islands have white roofs. And they use lime, just like you." This is another roof made hightly reflective using hydrated lime to coat an existing roof. The coating is very reflective, and while it does not last forever, it does last longer than you might think. Wolfgang has kept track of attic temperature and AC use and reports significant savings. A nice diy package of instructions for applying a reflective white coating to a black tar roof. A great passive way to provide significant building cooling. The paper provides measured attic temperatures in the summer in Florida for various types of roof construction. The plot to the left from the paper shows the effect of changing to a white roof about half way through the plot -- pretty dramatic. The FSEC site is a great resource for cooling ideas for hot humid climates. 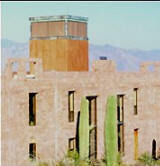 Paper provides measured ventilation rates and room temperatures achieved by four solar chimney designs. Another writeup on evaporative cooling towers with some design information. A passive cooling tower that uses wind and water evaporation for cooling. No blowers -- only electric demand is a small water pump. Some design rules, and several years operating experience. Earth tubes are tubes buried in the ground deep enough to take advantage of the more even year round temperature at depth. Air from outside the house is run through the earth tubes to heat or cool it before it is introduced into the house. In the summer, the earth is cooler that the outside air temperature and the air will be cooled as it goes through the tubes, and the opposite in the winter. This is a simple, energy efficient means of pre-heating or pre-cooling air, but there are a number of things to consider -- so do your homework carefully. Pretty good introductory article on earth tube cooling from Wikipedia. An interesting paper with some actual data on a real earth tube -- this might be helpful in designing your earth tube. The data includes temperatures along the tube, airflows, fan power, and COP. 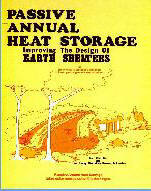 This book by John Hait is mostly about his Passive Annual Heat Storage home design, but it does have a section on earth tubes and how they are used on his houses. An interesting all around book. 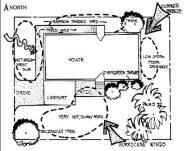 http://www.thenaturalhome.com/earthtube.htm Describes the way in which earth tubes are used in their house design. its hard for me to tell whether they have actually built one of these or not. This paper looks at the feasibility of using a solar chimney to drive flow through an earth tube. Both analysis and testing are provided. This company makes components for earth tube heating and cooling systems. The downloadable pdf provides some useful information for designing earth tube systems. EarthTemperatures.htm This material from the Virginia Tech website on Geothermal Heat Pumps has some good material on the variation in ground temperature with depth below the surface, area of the country, and season. Gary These are just some thoughts on earth tube design based on nothing more than reading the articles above. In some climates, fan forced ventilation and a 24 hour cooling strategy to reduce heat gain during the day, and make use of cool night air can be very effective. Whole House Fan pdf (240K) For relatively dry climates with cool nights, whole house fans are very effective in reducing or eliminating the need for refrigerated AC. I have had a whole house fan in my last two houses, and would not be without one! 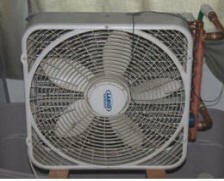 Another good guide on using and installing a whole house fan. 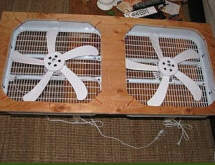 This is a nice and inexpensive way to get the equivalent of a whole house fan by using two large fans mounted in a window. This is cheaper, you don't have to cut a hole in the ceiling (and seal it up for winter), and you can just take it out for the winter. Flow rates appear to be close that that of a whole house fan. Ceiling fans are an efficient cooling method for some climates and conditions, especially when the use of a ceiling fan allows less use of AC. Energy Star ceiling fans use half as much energy as typical non Energy Star fans. Note the directory of approved fans, and the attention to making any light that might be included with the fan an efficient one. If you have several ceiling fans in your house, using energy efficient fans could save you as much as 1000 KWH a year, so its worth finding good ones and sizing them for the space. Ceiling fans with "Gossamer Wind" technology blades move about 40% more air for the same power use. Models are available that operate at 12 or 24V, and can be operated direct PV or battery. How to get articles from Fine Homebuilding .. A Fine Homebuilding article on choosing and installing a ceiling fan. Lots of detail on mechanical installation for both new construction and remodel, and detail on how to wire the fan. 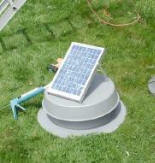 Guy Marsden describes how to install a solar powered attic vent fan. 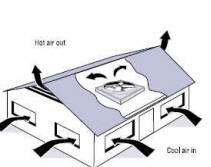 The fan lowers his attic temperature by abut 20 to 30F, which reduces heat transfer through the ceiling. Adding attic insulation and sealing plumbing and wiring penetrations through the attic ceiling are other ways to lower heat transfer from the attic to the living space. Details... This is the way we cool our house in SW Montana without using conventional AC. The strategy involves avoiding daytime heat gains, using cool night air for thermal mass cooling, and evaporative cooling on a few occasions. No AC. This is sort of a highly sophisticated version of a whole house fan. It eliminates or reduces the need for refrigerated air conditioning by using cool night air to pre-cool the house for the next hot day. The whole story... Fran shows how he used cool air from his basement to defeat the evil air conditioner. In some climates, evaporative (Swamp) coolers can be very effective in both reducing energy bills and avoiding that crumby, air-conditioned space feeling. Evaporative coolers can be very effective and energy efficient in hot climates that do not have high humidity. The newer indirect models can even be used in climates with somewhat higher humidity. The constant circulation of air avoids the stuffy feel of conventionally air conditioned spaces. This is a good article that covers: 1) the kind of savings that can result from a "swamp" cooler, 2) how to use a swamp cooler optimally, and 3) some good tips on installing and maintaining one. Mike is in Las Vegas and reports a 60% on his annual electric bill since using a swamp cooler for most of the cooling season over that past couple years. Energy Source Builder #36, December 1994. Article describes a house in Davis, CA (103F summer design temperature) with no refrigerated air conditioning system. The system uses night time ventilation and thermal mass to provide cooling. 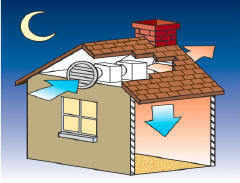 An evaporative cooler is operated at night to cool thermal mass. www.homeenergy.org ... Good and detailed report on a new generation of evaporative coolers that are more efficient, use less water, and require less maintenance. These cooler in a relatively dry climate can save 90% compared to compressor driven conventional air conditioning! www.voltscommissar.net/competitive_edge.htm These evaporative coolers use low HP 12V fans that can be powered by PV arrays. While these papers seem to be aimed primarily at commercial applications, residential applications may well be workable, simple, and energy efficient. foot of roof surface) to a final temperature as much as 12 degrees below the minimum night air temperature." Seems like a very promising way to reduce the energy cost of cooling. The 5600 sqft prototype described in the first link achieved an EER of 149. Information for designing and making your own evaporative pad cooling systems. I have seen systems of this type in greenhouses for cooling. Detailed plans for making evaporative coolers. 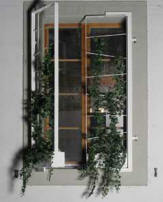 Intended for greenhouses, but may be adaptable to other situations. 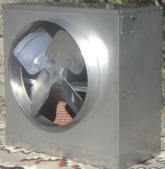 http://robotfun.wordpress.com/2011/12/21/swampcooler/ This is a pretty slick homemade evaporative cooler. This one was made for camping, but it could be used in a variety of situations. 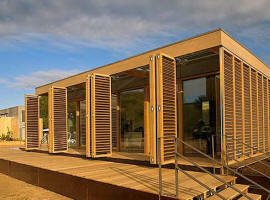 It can be solar powered, so its also good for saving energy and for power outages. Christin provides nice detailed instructions as well as links to other small and larger DIY evaporative coolers. This is a pretty clever and simple cooler for cooling a small space (like a homemade electric car that does not have AC). 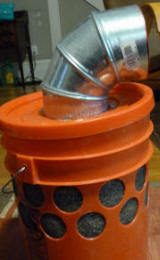 Total cost is a 12 volt DC can and a bucket -- can't get much simpler than that. Basically, the fan blows air over the ice or water frozen in pop bottles in the bucket. Have look around Michael's How To Electric Car site while you are there. 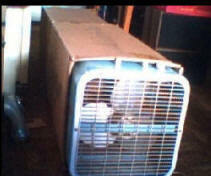 Tom's home made evaporative cooler for his RV. Tom uses this to cool his RV without having to use grid power, but it could be adapted for all sorts of cooling applications, including emergency cooling when the power grid is down. Install Manual (pdf) This is a small 12 VDC evaporative cooler that is intended for RVs, construction equipment, ... but might work well in any small space. The fan draws 4 amps, and the company says it will run directly off a 60 watt solar panel. This is David's very efficient space cooling system. At night, the system pumps water from a tank up to a roof spray tube. The water runs down the roof cooling by radiation to the night sky. The water is collected at the bottom of the roof and channeled back to the tank. The following day, the cooled water in the tank is used for space cooling. David is interested in hearing from people on the best way to do the final version of this system. David provides a very detailed description of hte system and some measure performance. Chad uses evaporative cooling to reduce the temperature of the air that cools the condenser coil on his air conditioner. The AC efficiency is significantly affected by the condenser cooling air temperature, so this change both increases the AC capacity and also reduces energy use. This evaporative cooling scheme does not leave mineral deposits on the condenser coil. Note: I would tend to NightCool in the Experimental area, so, if you go after this, bear in mind you may suffer the "being a pioneer" learning curve. Please let us know how it comes out. 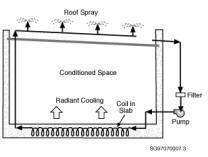 This is a simple, building integrated, cooling scheme that uses nighttime radiation cooling from a metal roof to cool air in the attic space. Attic air is then circulated into the living area to provide cooling. A simulation model is used to predict performance in various climates -- the scheme works very well in dry areas, and fairly well even in very difficult moist-warm climates (e.g. Florida). One of the attractive features of this system is that the roof is very conventional -- no massive ponds or moving insulation. There is the potential in some climates to use the same metal roofing/attic system for space heating in colder weather. The new test report shows the results for two 10' by 16' structures that were built to compare NightCool performance to conventional AC in Florida. Very interesting and promising results. Tests of a a simple dehumidification system using desiccants are now underway. A home constructed in a very difficult cooling climate (central Florida) to see if a combination of passive cooling techniques to reduce heat gain, high efficiency AC, efficient appliances, and a fairly large PV rig could produce near zero net energy use. The home was largely successful in meeting these goals. Net energy use was only about 18% of a control house built to current codes. Pretty good detail on how much energy each feature saved. My 2 cents would be that the passive cooling, high efficiency AC, and efficient appliances contributed 67% the of the savings, while adding little to the cost of the house. The 4KW PV rig contributed the other 33% of the savings, and probably cost about $40,000. The method looks like it might provide cooling with a COP of 42 (SEER 140) or more! An article from the Energy Source Builder Newsletter on using hydronic heating systems for cooling, including radiant floor systems. 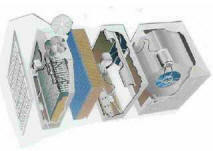 A paper on sizing commercial roof spray cooling systems... Roof sprinkler system lowers roof temperature and cooling bills by keeping the roof cooler through water evaporation. 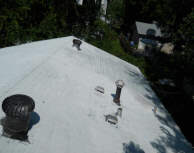 This is a small business that offers a roof sprinkling system to cool attic areas. They also sell parts to people who want to build their own system. They have a detailed installation manual that should be helpful to those building a system. "In this small 1000 sq ft slab and block beach home, a well pump provided water to a washing machine water valve that was actuated with a temperature switch from an attic exhaust fan which operated both the fan and the valve. Connected to the water valve was a soaker hose like the ones used to water a garden, mounted on the roof's peak. There was no other cooling system in the house." 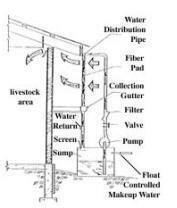 Sounds like a nice simple way to do the control system for roof sprinkler. DripWorks.com sells a misting kit that provides mist cooling for about 25 lineal feet (3 misters). Said to be easy to hook up. Mist cooling can be very effective and comfortable if done well. I've ordered the kit and will report on how it does. It looks like water usage is about 3/4 gallon per hour per mister outlet. A very simple mist cooler for large outdoor areas. Intended for cows, but I don't think they will mind if you use their idea. Rick uses a water to air heat exchanger to extract some "coolth" from the water he is using to water the lawn. An interesting concept to provide a comfortable, air-conditioned environment in a limited space for sleeping comfort. It saves the energy cost of needlessly air-conditioning a large space when your are only occupying a small space. The same idea could be used for the heating season with a small heater in the bed cubby. Water bed cooling Randy suggests that in hot climates sleeping directly on the water bed bladder will be cooler. Remove all the coverings except for a sheet or two, and let the water conduct heat away from your body. The temperature of the water in the bladder will be the average of the last few days, and cooler than body temperature. After more experience, Randy adds that during the cooler season, you want more insulation (e.g. a blanket) between you and the water bladder to keep it from getting to chilly. Its a mater of adjusting the amount of insulation between you and the thermal mass.